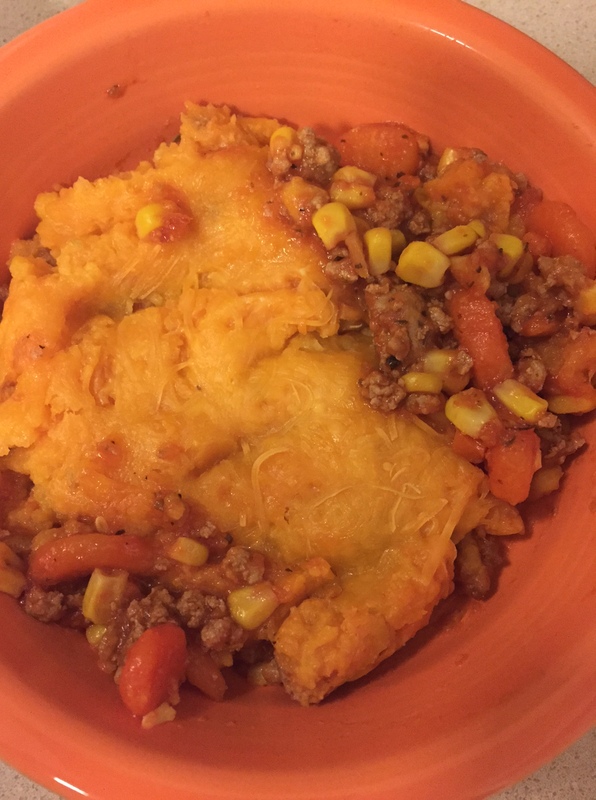 I found a recipe for sweet potato shepherd’s pie from Tried and Tasty on Pinterest. How had I never thought of using sweet potato before? Genius. I was a little iffy about using tomato sauce instead of gravy, since that seems like a much different flavor from my usual shepherd’s pie. But it got rave reviews, and it was covered in cheese, so I gave it a try. And it was so yummy, and pretty low-cal! I can’t really describe why the flavor worked, but it did. So trust me and give it a try! Next time I may see if I can make my mom’s trusted version with sweet potato but substitute a lighter gravy or something. But that’s a challenge for another day. Enjoy this one! 1.) Preheat oven to 350. In a medium pot, boil sweet potato cubes until soft; approx. 10-15 minutes (depending on the size of your cubes). 2.) While sweet potatoes are boiling, heat olive oil on medium-high in a large pan and saute onions until translucent; 3-5 minutes. Add ground turkey; brown and season with garlic powder and Italian seasoning. 3.) 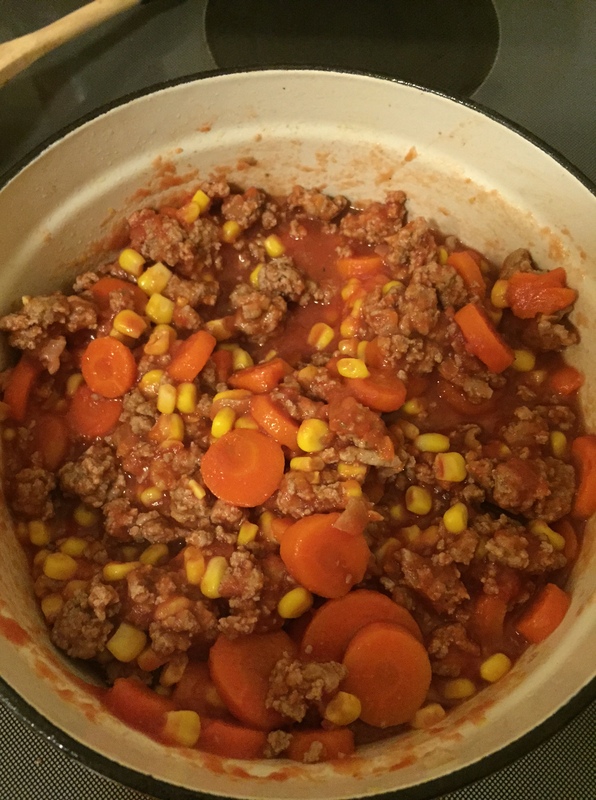 Add corn, carrots, and tomato sauce. Heat throughout. 4.) Once potatoes have softened, drain all water and mash. 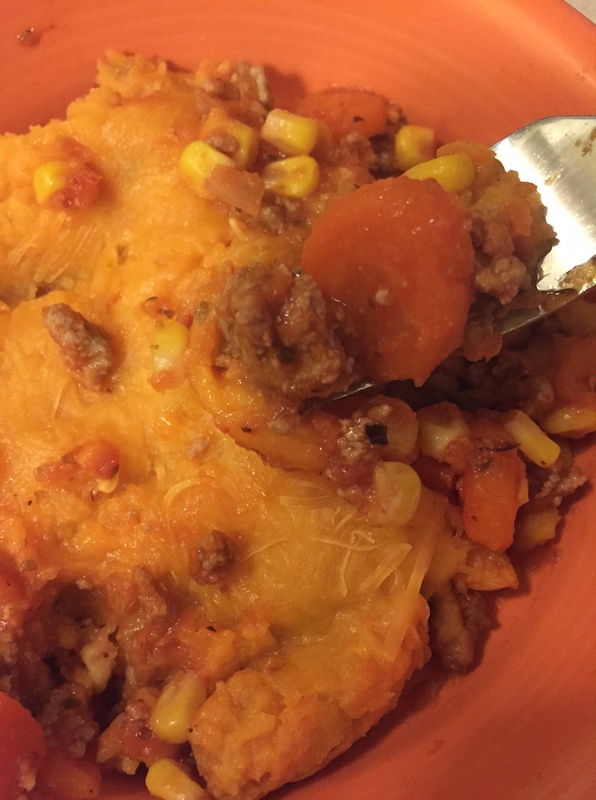 Spoon meat mixture into the bottom of a casserole dish (or 2 8×8 pans) and cover with prepared mashed potatoes. 5.) 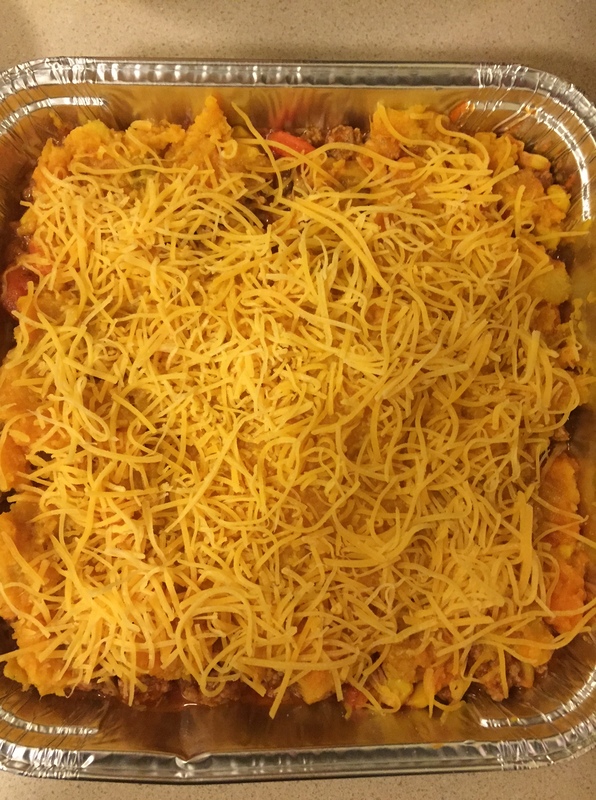 Sprinkle with shredded cheese and bake for 15-20 minutes until cheese is melted. 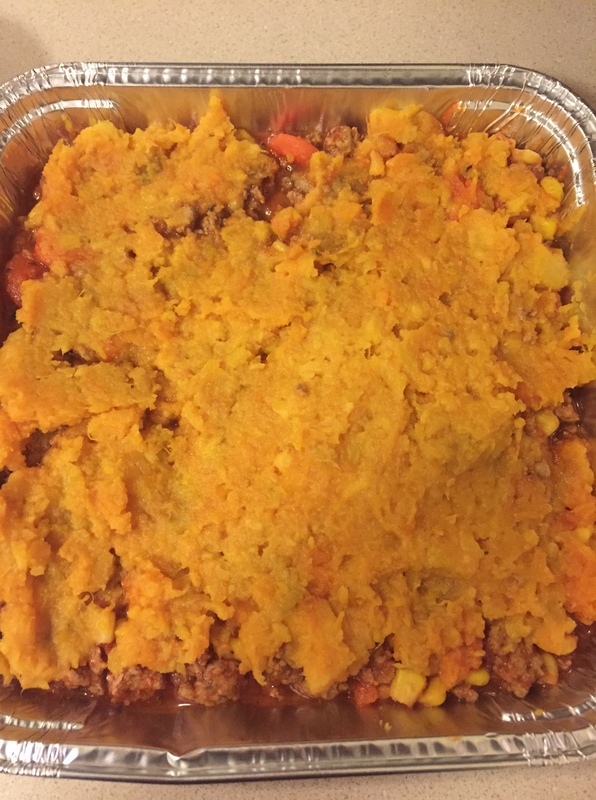 **I made this in 2 8×8 aluminum pans, rather than a casserole dish, because I wanted to freeze half. So I put one in the freezer before baking and without cheese, that way I could put it right in the oven some other busy week! Each 8×8 pan was 3 servings. At the beginning of December, I decided to buy the Amanda Adams AA Bikini Body program because I needed a new workout plan. I like having a schedule to follow at the gym, otherwise I tend to go and just do the same things or a random assortment of things. It’s a 12 week program, with totally doable workouts and a meal plan, which basically just outlines the calories you should be consuming per day (mine is 1900, so not depriving myself!) and the breakdown of nutrients (protein/carb/fat) to strive for. I’ve been using the MyFitnessPal app to help with this, and I like it because I can put in my own recipes to see the calorie and nutrient breakdown! I am now in Phase 2 of the workouts and love it so far. I can feel and see my muscles getting stronger, and I am sore as I am typing this! The program was designed by Amanda Adams, a fitness model, and Ander Wilson, a nutritionist. How cute are they?? I am also happy to report that 2015 has been awesome so far! I’ve been hanging out with friends and our new dog, I booked a vacation to South and North Carolina for March, and am really taking time to appreciate all that I have in life. Looking forward to seeing what else 2015 has to offer!